The TOTO Washlet S550e Elongated Bidet Toilet Seat with ewater+ and Auto Open and Close Contemporary Lid is an electronic luxury seat that cleanses you with warm water, providing an exceptionally clean feeling. Instead of traditional toilet paper that can sometimes be rough and often ineffective, the Washlet quickly provides comfortable warm water cleansing at the touch of a button. A once mundane trip to the bathroom can become a spa-like experience with a Washlet. The Washlet features TOTO's technologically advanced ewater+ system which uses electrolyzed water generated by a technologically advanced process, transforming the water into a safe and powerful compound. By misting the bowl after every use, the ewater+ technology helps to keep your toilet bowl clean and hygienic without any extra harsh chemicals. The Premist function sprays the bowl with water before each use, preventing waste buildup and keeping the toilet bowl clean. The TOTO Washlet S550e is operated by a luxury style illuminated touch activated remote with 2 user memory to save preferred settings. The Washlet features 5 spray settings, dryer, air purification, auto open and close lid, heated seat, a nightlight, and instantaneous water heating. The newly redesigned lid style lies flush with the toilet bowl, providing a streamline look and giving the impression of an integrated system. The minimalistic display provides a more subdued appearance to your Washlet. The Washlet reduces the need for toilet paper, saving trees and water used to manufacture each roll. As we get older, our mobility can deteriorate and make it increasingly hard to clean ourselves after toileting. Medical conditions and debilitating illnesses can make using the bathroom without assistance almost impossible. With a Washlet, just the touch of a button can leave you feeling clean. Includes mounting and connection hardware. Washlet performs a Premist of bowl before each use to help prevent waste from adhering. Sensor operated, auto open and close lid and seat detects the user. Tankless, instantaneous water heating means never running out of warm water. Built in nightlight fills the bathroom with soft light. Contemporary lid resides flush with the toilet bowl, providing a streamlined look and giving the impression of an integrated toilet and Washlet system. 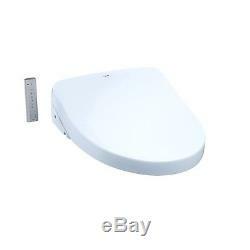 Minimalistic display provides a more subdued appearance to your Washlet. Improved sensor performance reduces sensitivity of auto functions to enhance a tranquil bathroom experience. 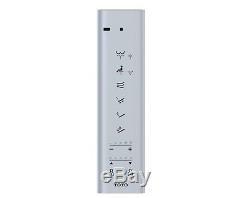 Luxury style illuminated touch activated remote with 2 user memory to save preferred settings. Automatic air purification system removes odors while sitting on the seat. This is the top of the line model. The item "TOTO Washlet S550e Elongated Bidet Toilet Seat -Light, Auto close" is in sale since Friday, September 28, 2018. This item is in the category "Home & Garden\Home Improvement\Plumbing & Fixtures\Bidets & Toilet Attachments". The seller is "groxxdeals" and is located in Sherman Oaks, California. This item can be shipped to United States, Canada, United Kingdom, Denmark, Romania, Slovakia, Bulgaria, Czech republic, Finland, Hungary, Latvia, Lithuania, Malta, Estonia, Australia, Greece, Portugal, Cyprus, Slovenia, Japan, China, Sweden, South Korea, Indonesia, Taiwan, Thailand, Belgium, France, Hong Kong, Ireland, Netherlands, Poland, Spain, Italy, Germany, Austria, Israel, Mexico, New Zealand, Singapore, Switzerland, Norway, Saudi arabia, Ukraine, United arab emirates, Qatar, Kuwait, Bahrain, Croatia, Malaysia, Brazil, Chile, Colombia, Costa rica, Panama, Trinidad and tobago, Guatemala, Honduras, Jamaica.